Saturday, April 30, 2011, at 2:00 p.m.
27 March 2011 Updated! No major New York City newspaper has reported that Mayor Bloomberg was booed at the Triangle Shirtwaist Fire 100th anniversary ceremony. NYC Mayor Michael Bloomberg was booed at the 100th Anniversary of the Triangle Shirtwaist Factory fire ceremonies today. NEW YORK - At a ceremony commemorating the 100th Anniversary of the Triangle Shirtwaist Factory fire, Mayor Michael Bloomberg was loudly booed by labor activists and union supporters, the wire service Agence France-Presse reported. Mayor Bloomberg had been delivering a speech about fire safety and the importance of labor protections when activists began to boo the unpopular mayor. The ceremony took place in Greenwich Village, outside the building where the fire broke out on March 25, 1911. The building is now owned by New York University. Since he changed the term limits laws to run for a previously impossible third term as mayor, Mr. Bloomberg, a billionaire, has been on a scorched-earth campaign to shut down firehouses all across New York City. Critics allege that the closing down of firehouses and the layoffs of firefighters would put the city at risk should a large fire take place. Today's ceremony was marking the deaths of 146 people at the Triangle Waist Company ; the outrage following the fire and deaths resulted in reforms in labor laws in New York and around the nation. 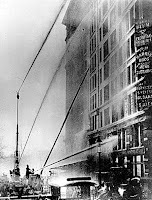 For weeks before the memorial ceremony, many newspapers and even some cable news channels, such as NY1, had been paying tribute to the ''far-reaching impact on workplace safety, the labor movement and the New York political scene'' that came about as a result of the Triangle Shirtwaist Fire. To not report how community activists booed the New York mayor over his scorched-earth campaign to close down firehouses, attack city unions, and do nothing to prevent hospital closings reveals that the media tributes were not only superficial, but, at the end of the day, the total media coverage has been an insult on the sacrifice made by the 146 people, who died in 1911. Mayor Michael Bloomberg launches a major TV advertising blitz to fluff his ''reputation,'' even as his goodwill amongst voters shrivels up. Mayor Bloomberg has reportedly made a media buy of almost $1 million worth of TV commercials that tell the story that he has been ''fighting for New York,'' instead of trying to close firehouses, shut down senior citizen centers, cut childcare, layoff teachers, avoid missing votes, build luxury condos on the hallowed ground of St. Vincent's Hospital, make money from government information, and end Progressive Era reforms. It should come as no surprise that, consequently, Mayor Bloomberg is falling in popularity amongst voters. It's almost as if Mayor Bloomberg's legacy has been flushed down the toilet. Gary Tilzer's blog, True News From Change NYC, about New York government corruption, political reporting, and other commentary about government transparency, has been restored. Earlier today, it had been discovered that the True News blog had been suspended by Google for inexplicable reasons overnight. The suspension of the blog had become a focal point of support today by many New York bloggers and activists. No reason for the suspension is yet known, but New York bloggers suspect political censorship might have been one motive behind the removal of the blog. Please send an e-mail to press@google.com and copy Gary Tilzer, the owner of the censored blog, at Gtprinter@aol.com -- demanding that the True News blog be restored. This is not the first act of censorship against Mr. Tilzer. Before the 2010 election, a YouTube video that Mr. Tilzer produced was banned by NBC/YouTube and had to be replaced with an edited version. In the last couple of years, others have faced incidences of cyber censorship or retaliatory activity. One and a half months before the 2009 election, the YouTube channel owned by the artist and political commentator Suzannah B. Troy was likewise censored, until bloggers and a lawyer intervened on her behalf. In 2010, this blogger was attacked by computer viruses 3 or 4 times, including on the day this blogger reported to the New York Department of State Committee on Open Government an act of censorship committed by Brad Hoylman. We need your help to keep courageous bloggers, like Mr. Tilzer, doing what they do. If you are reading this, it is because you are turning to the Internet for reliable information. For it to be here, bloggers, like Mr. Tilzer, have to be able to do their work without fear of retribution or censorship. Join us on Sunday, October 23, 2011, at 2 pm, outside City Hall, for a protest to mark the third anniversary of the City Council vote that overturned term limits. Back on this day in 2008, the New York City Council voted to change the term limits law, thereby allowing Mayor Michael Bloomberg to seek re-election. The action by the City Council, lead by Speaker Christine Quinn, undid the term limits approved by New York City voters, who had previously passed two referendums that had restricted the service of elected politicians to a limit of two four-year terms. Vote Quinn out of office ! 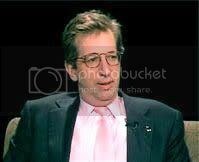 Rudin Interview on New York Real Estate Harvesting From Bankrupt Hospitals. William Rudin, chief executive officer at Rudin Management Co., talks about New York City's real estate and the outlook for commercial property, including the millions the family stands to make from the carcass picking of the real estate property of St. Vincent's Hospital. Watch at 5:40. To add insult to injury, naturally this interview was broadcast on Bloomberg Opinion, in keeping with Mayor Michael Bloomberg's worldview of starving the beast until it dies in the back of an ambulance, stuck in crosstown traffic. In New York City, Do We Have Any Leadership Among Elected LGBT Politicians ? Members of the LGBT equality advocacy group called Queer Rising blocked traffic near Bryant Park on March 1, 2011, in an act of civil disobedience, demanding marriage equality in New York. Eight activists from the were arrested after the group had unfurled a 75-foot banner and blocked traffic on 42nd Street and Avenue of the Americas in New York City. The activists were later released by police, according to a statement issued by GetEQUAL. The marriage equality demonstration was reported about by a network-affiliate news program on WPIX 11. Following is the full statement from GetEQUAL, followed by additional links to other Internet coverage of the protest and the arrests. Earlier this morning, eight activists were released from a NYC jail after they took action to stand up to our politicians' unceasing cowardice to do what's right for the LGBTQIA community. After years of waiting for marriage equality in New York and countless broken promises, members of the direct action group Queer Rising, allies of GetEQUAL in New York, demonstrated their growing frustration by sending a clear message to our elected officials. At 8:30 this morning Kevin Beauchamp, Nora Camp, Natasha Dillon, Frostie Flakes (Adam Siciliano), Jake Goodman, Honey LaBronx (Ben Strothmann), Eugene Lovendusky, and Kitten Withuwip (Caldwell) blocked traffic at the intersection of 42nd Street and 6th Avenue in Manhattan, where they unfurled a 75-foot banner that read "NY DEMANDS MARRIAGE EQUALITY NOW!" and chanted "I Am...Somebody! I Deserve...Full Equality! Right Here, Right Now! I Deserve...Full Equality!" We know the courage these eight activists showed today is the same courage that lives inside many who are reading this email right now -- that the hunger for full equality that drives these activists is the same hunger that drove the suffragists to keep fighting for their right to vote; it's the same hunger that drove our civil rights fighters to keep fighting for their constitutional guarantee of equal protection, equal opportunity, equal access and equal justice; it's the same hunger that drives our fellow LGBTQIA brothers and sisters to keep fighting for the day when our dignity will be recognized, our love will be revered and our humanity will be respected. Today's action is just the beginning of a sustained campaign that Queer Rising will be organizing in the months to come, in partnership with GetEQUAL and other civil rights activists in New York. If you're hunger for equality is pushing you toward taking up the fight, whether occasional grumblings or unrelenting pangs, today we invite you to take action for what is rightfully ours -- full equality! If you want to get more involved with equality organizing in New York, email GetEQUAL.NY@gmail.com and we'll get you connected with opportunities in your area! 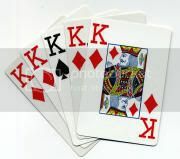 Christine Quinn Is Playing With A Stacked Deck. When you ask New York City Council Speaker Christine Quinn a question, she likes to give you a non-answer. She likes to be evasive, but she is definitive about giving you the run-around. She doesn’t have to give you either a proverbial bait-and-switch or back-pedal, provided she never has to first give you any policy position with which to lure you. Mind you, under Speaker Quinn, the City Council found it within its powers to over-turn in 2008 two voter referenda approving term limits, thus allowing Mayor Michael Bloomberg to run for a previously forbidden third term, but as to whether the City Council could require the mayor to leave a forwarding address, she would have to, proverbially, get back to us on that. If democracies are supposed to work efficiently only if voters know well each of tge issues and the politicians who run for and hold office, then our experience with this pattern of deliberately evasive non-answers isn’t going to lead us to the path where voters know where we stand vis-à-vis Speaker Quinn. But that’s her real intention. She doesn’t want us to know where we stand. If we are like a « deaf speactator in the back row, » as Walter Lippmann has described disenfranchised voters, then that makes it easier for politicians like Speaker Quinn to avoid the messy work of having to live up to an ethic. But to Speaker Quinn, who is climbing up the political ladder with her wagon hitched to Mayor Bloomberg’s coattails, taking on the powers that be is not likely going to happen. Taking a public policy position means you have to have something to fight for, and you have to be somebody, who fights for that in which you believe. Using the spree of hospital closings in New York City, including that of St. Vincent’s Hospital, as a litmus test for Christine Quinn’s ethics. At an emergency community meeting in the West Village on January 28, 2010, just weeks before St. Vincent’s Hospital was to close, Speaker Quinn gave what should have been, by all accounts, a touching and inspiring speech. She endorsed the idea that fighting for the hospital’s survival was critical to New York City. There are times, like in the preceeding Save St. Vincent’s video, when Speaker Quinn can tap into the truth that the common New Yorker senses : that our economy and our social safety nets are a giant rug that is being pulled out from under us, and that, inspite of the horror, she sells herself as courageous enough and willing enough to fight for a progressive agenda. 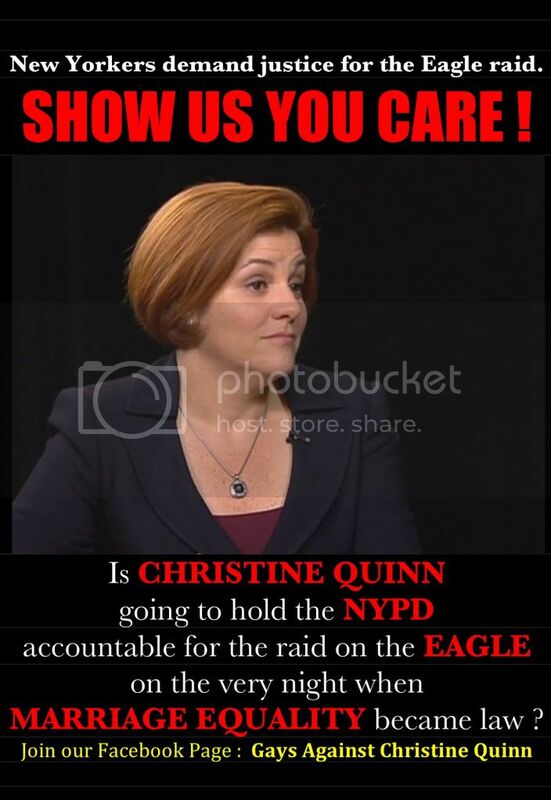 But in the year since Speaker Quinn spoke with such leadership at the emergency community meeting at Our Lady of Pompeii Church in Greenwich Village, we need to make an assessment of where we now find her in the fight to restore a hospital to the Lower West Side of Manhattan. Indeed, as at February 26, 2011, according to Councilpedia statistics, Speaker Quinn had received over $569,000 in 2013 election cycle donations from the real estate industry. You don’t need me to tell you that that is a lot of money. 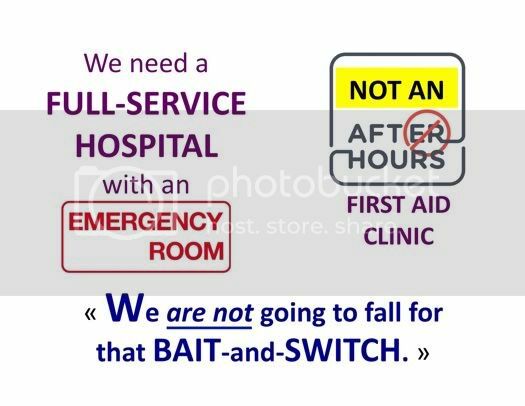 What Speaker Quinn is gambling, the deal that she is making with the Devil, is that nobody is going to call her on her inability to make good on simple policy decisions, like « We are not going to fall for that bait-and-switch. » She is also counting on nobody getting outraged enough to say that the influence of real estate developers, as indicated by their large campaign contributions to Speaker Quinn's campaign treasury, is over-riding the needs the voting public. But with social media tools, such as Councilpedia, the old political boss ways of days gone by are numbered. What is more, in the political vacuum of Speaker Quinn’s definitive non-answers, she is creating opportunities for other politicians, to swoop in and offer voters a new sense of hope. When he was a councilmember, John Liu found the courage to give press conferences about the performance of, dissatisfaction with, and budget crisis overseen by Speaker Quinn. In the face of Speaker Quinn’s passivity, other leaders are stepping forward to demonstrate dynamism, charisma, and decisive leadership. The Definitive Answer to End the Cycle of Cynicism is Alive and Well In a Surprising Group of Activists and Leaders, among them Mr. Liu, Manhattan Borough President Scott Stringer, and the civil rights lawyer, Yetta Kurland. If Mr. Liu continues to investigate questionable technology contracts, he is sure to win the praise of voters, who are tired of seeing tax money disappearing into blackholes of politically-awarded governemnt contracts, while, at the same time, the mayor runs his scorched earth campaign of school and firehouse closings with the tortured logic of the need to make budget cuts. Shockingly, in the time that Speaker Quinn has presided over the New York City Council, at least eight city hospitals have closed. In 2010, North General Hospital in Harlem declared bankruptcy and St. Vincent's Hospital in the West Village shut down after shady backroom meetings. In 2009, two hospitals in Queens – St. John's Queens Hospital in Elmhurst and Mary Immaculate Hospital in Jamaica – went bankrupt. In 2008, Cabrini Medical Center in Manhattan, Parkway Hospital in Queens, and Victory Memorial Hospital in Bay Ridge closed. 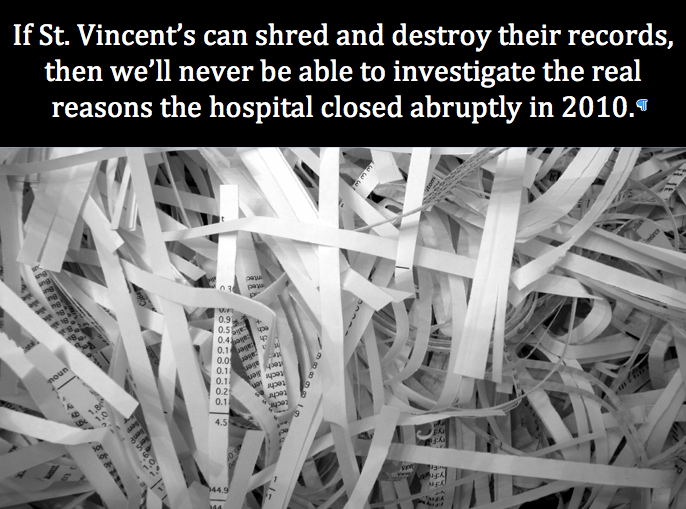 And in 2007, St. Vincent's Midtown in Manhattan was closed. Separately, one other hospital in Brooklyn, Long Island College Hospital, was recently saved : it had been on the brink of closing, and the only way the hospital was saved was by merging it with SUNY Downstate. To some degree or another, each of the communities impacted by these hospital closings have objected, protested, or tried to litigate the decisions that lead to a hospital being closed in their community. But in no instance has a grass-roots community organisation powerfully come together as has happened following the closing of St. Vincent’s Hospital in Greenwich Village. There, a group called the Coälition For A New Village Hospital has been agitating, protesting, holding emergency community meetings, packing into Manhattan Community Board meetings, and litigating their cause to, first save St. Vincent’s Hospital, then, after the hospital closed, to restore a new hospital to the former site of St. Vincent’s. The group has shocked the normal course of cynical city politics, because, as we approach the one year anniversary of the closing of St. Vincent’s, this community group refuses to go away quietly. When the community heard « We are not going to fall for that bait-and-switch, » they believed it. Now, they’ve organised to make good on restoring a hospital to the Lower West Side of Manhattan. Recently, four community activists were even arrested after orchestrating a restro sit-in at the former main building of St. Vincent’s in a courageous act of civil disobedience ; the four activists spent one night in jail before they got processed out of the court system. 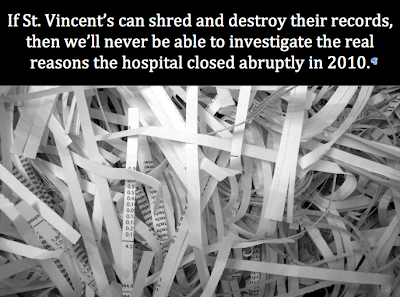 The closing of St. Vincent's has even inspired the creation of a non-violent civil disobedience movement. The sense in the community is one of dire seriousness. St. Vincent’s was more than a hospital, it was also a Level 1 trauma center, which, for Lower Manhattan, had served as a critical underpinning for New York City’s emergency preparedness in this post-9/11 world. Some see a parallel between the need to be ready for another terrorist attack in Lower Manhattan and the fight to keep essential municipal services and basic infrastructure. And given that Speaker Quinn takes so many campaign contributions from the real estate industry, some community activists are sensing that the fight for a new hospital transcends a mere fight to preserve basic infrastructure, but it also taps into the historical tradition in Greenwich Village to fight urban renewal imposed by political figures, who force through neighborhood-destroying mega-development projects. In the face of over-development, there is a chance that New York City communities will link up in a city-wide grass-root effort to block urban renewal projects that would destroy the character of our neighborhoods. In August 2010, Speaker Quinn advocated and won approval from the City Council for a 67-floor skyscraper just two blocks away from the Empire State Building. The new building is to be built in Speaker Quinn’s district. When The Gotham Gazette reported about the skyscraper’s approval, the newspaper quoted the City Council Speaker thusly : « We want new Rockefeller Centers. … New York City is about growth -- about growing bigger and higher all the time. » Whereas, all New Yorkers take pride in living in a vibrant city, we think that all the zone-busting development projects are just a revival of Robert Moses’ twisted idea that New York City should be one giant crosstown expressway, only this time the city planning idea being pushed is more skyscrapers and more and more glass and steel luxury condominiums. And as in that time then, when Mr. Moses’s overdevelopment plans shocked the conscious of New Yorkers, unintentionally launching the careers of a whole wave of civic activists lead by Jane Jacobs, now in this time here, we have the creation of similar conditions under which Speaker Quinn’s development plans are triggering a new wave of civic activists, who are pushing back, who are saying, « Enough is enough ! » Whereas the popular perception then was that Mr. Moses was motivated by a power trip that made him feel like he needed to be in control over all major development projects in such a mania that bordered on demolishing as much of old New York as he could, we don’t know if Speaker Quinn is motivated by the same ambition. But we do know that she is in a race to raise substantial amounts of money to mount an expensive political campaign to become mayor of New York City in the elections of 2013. The Coälition For A New Village Hospital is based squarely within Speaker Quinn’s City Council district. The Coälition has been networking with various city and state politicians, to find a champion on the inside, who could launch an investigation into the finances and the mysterious closed-door meetings that lead to the closing of St. Vincent’s. The Coälition has also been working to feverishly prevent any change in zoning for the main buildings that served as home to St. Vincent’s, to preserve the existing infrastructure for any new hospital that would be interested in replacing St. Vincent’s. Remember that in about the course of one year, we heard Speaker Quinn change her tune from : « We are not going to fall for that bait-and-switch, » to : « As the sale of St. Vincent’s properties makes its way through bankruptcy court. » The community sees the writing on the wall. And right now, there is no full-service hospital in the entire West Side of Manhattan from Columbus Circle all the way down to Battery Park. And with the loss of St. Vincent’s Level 1 trauma center, all of Lower Manhattan is at risk should another terrorist attack again happen below 14th Street. Even if Speaker Quinn really, deep-down, believed that the Lower West Side needed a hospital, nobody but her and her political campaign know for sure if she is really fighting for one, or if she is just going through the motions, a political bluff known as astroturfing. Do the liberal and progressive politics of Manhattan Borough President Stringer include a real sensibility for the spirit of Jane Jacobs' ethics about responsible urban planning to prevent community decay ? President Stringer is an accomplished politician. His entry into politics was initially shaped by having served as a legislative assistant to Congressman Jerrold Nadler, back when the Congressman was an Assemblyman. Before he was elected to preside over the Borough of Manhattan, President Stringer served as an Assemblyman himself, representing the very seat once occupied by Congressman Nadler. A true Democrat, President Stringer has the support of progressive Democratic political clubs in New York City, among them the Jim Owles Liberal Democratic Club, named for the legendary gay activist Jim Owles. Like any elected politician, President Stinger has not been able to please all of his critics. But residents of the Lower West Side -- and beyond -- are turning to him for the opportunity that both see in each other : a way to legally preserve the zoning of the former St. Vincent’s buildings, as well as a way to elect a mayor, who could hear the calls from the community to reverse the spree of hospital closings and to put a stop to the irresponsible and systematic demolition of old New York. Already, the movement for a new Lower West Side hospital has attracted members or former members of major LGBT organizations such as ACT-UP and Queer Rising, among others, plus the conribution of activists outside of Manhattan. And the movement has also guaranteed the ascendancy of civil rights attorney Yetta Kurland as a respected community leader. Therefore, President Stringer is looking at the formation of an almost instant coälition of support for his mayoral candidacy, provided he delivered quickly on an enforceable zone-block to preserve the integrity of the St. Vincent’s properties, before the buildings are sold in bankruptcy court. If President Stringer played by the normal cynical rules of New York City politics, he would be all talk and no action. But if he was ready for a game-changer, one that would transform him into an instant populist hero, he would call Speaker Quinn on what everybody sees as one of her two Achilles’ Heels : her St. Vincent’s astroturfing bluff. (Speaker Quinn's other Achilles' Heels are term limits and the slush fund scandal.) She says that she supports a new hospital, while, at the same time, she is taking tens of thousands of dollars in campaign contributions from the very real estate industry that stand to make tens of millions, and possibly hundreds of millions in profits, from the demolition of the St. Vincent’s properties and the development of more glass and steel high-rise luxury condominiums in the heart of community where Jane Jacobs used to call home. And Speaker Quinn’s gamble is that she can get away with giving definitive non-answers when everybody in her very City Council District is longing for decisive leadership to restore a hospital at the former site of St. Vincent's. In the wake of the announcements that Mayor Michael Bloomberg plans to layoff 6,000 teachers, cut daycare and senior citizen centers, and cut the budgets of independently elected officials, like the offices of the public advocate and the borough presidents, politicians and community leaders are decrying the mayor's cuts as politically-motivated. For example, The New York Post questions why Mayor Bloomberg is blaming Gov. Andrew Cuomo over the loss of $600 million in state funding. In an NY1 broadcast, the mayor even called Gov. Cuomo ignorant about the city's budget. Meanwhile, in respect of the proposed budget cuts to the offices of the public advocate and borough presidents has outraged Scott Stringer, the Manhattan borough president. Mr. Stringer told The Journal that under the twin administrations of Mayor Bloomberg and City Council Speaker Christine Quinn, the annual process for setting the budgets for the borough presidents and the public advocate has become the “most politicized” in a generation. Moreover, that the mayor seems obsessed with laying off public school teachers has worried others whether the mayor is, indeed, making biased budget cuts. "His complete insistence on teacher layoffs seems bizarre to us at this point. We think it's more of a political game and scaring people," Michael Mulgrew, president of the United Federation of Teachers, told NY1 television, according to Yahoo! News. Separately, proposed budget cuts to public libraries have triggered a backlash : is Mayor Bloomberg attacking freedom of expression, education, and access to information ? In an apparent conflict of interest, Beth R. DeWoody, Madeleine R. Johnson, Eric C. Rudin, Jack Rudin, Katherine Rudin, and William C. Rudin each donated $4,950 to Christine Quinn's presumed 2013 mayoral campaign. During this time, the Rudin family has been trying to salvage a multi-million dollar real estate purchase of the buildings that belong to the bankruptcy estate of St. Vincent's Hospital. 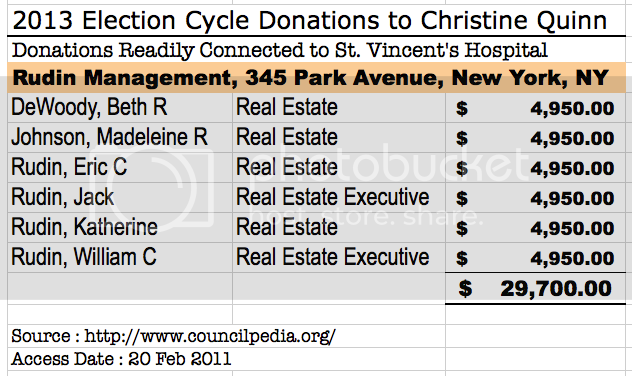 Since the Rudin family wants to build luxury high-rise condos on the site of St. Vincent's, do these large campaign donations explain why Speaker Quinn has done nothing to restore a hospital to the former St. Vincent's site ? In contradictory new developments in the trial against GOP operative John Haggerty, prosecutors from the Manhattan District Attorney's office allege that ''Mr. Haggerty lied to the Bloomberg campaign to get it to pay $1.2 million to the Independence Party,'' according to court documents released on February 17 and reported about by The Times. How did Mr. Haggerty lie to the Bloomberg campaign to get it to pay $1.2 million to the Independence Party, if the campaign to reëlect the mayor (CREEM) knowingly used Mayor Bloomberg's private banking accounts to ''wash in'' money in order to deliberately funnel the Independence Party donations to Mr. Haggerty ? Mr. Haggerty's attorneys suggested the district attorney's office should "commence an investigation immediately" into the possibility that the mayor violated laws by transferring personal funds to the Independence Party for the direct purpose of helping his campaign with a ballot-security operation. If Mr. Bloomberg "made the contribution directing how it should be spent, he would be in violation of both the New York State Election Law and the New York City Campaign finance Law," Mr. Haggerty's attorneys allege. According to New York State law, contributions in excess of $94,200 to a state political party are prohibited from being used to promote a candidate, The Journal reported. Furthermore, New York City law requires politicians' electoral campaigns to report and disclose campaign-related expenditures, and The Journal added that Mayor Bloomberg's ballot-security operations expenditures were not reported or disclosed by CREEM. Adding to the lack of transparency about Mayor Bloomberg's intent in structuring the expeditures by transferring personal funds to the Independence Party is the fact that the Mayor's Office refuses to release all related e-mails about campaign-related activities. After The New York Post filed a Freedom of Information request, demanding more information about Mr. Haggerty's involvement with the Mayor's Office, the Mayor's Office release only "nine e-mail exchanges" between Mr. Haggerty and "mayoral aides" during 2008 and 2009. "There were other e-mails that the mayor's refuses to release on the grounds of 'personal privacy,' " The Post reported. Meanwhile, back to The Times's own report about the February 17 court documents : this is the first time that prosecutors have said the Independence Party may have known about the alleged fraud. But The Times seems to be continuing with the storyline that the ''fraud'' committed was that the act that Mr. Haggerty used the CREEM payments for personal use, not that CREEM failed to disclose Mr. Haggerty's work as campaign-related activities. ''An extensive review of records and campaign documents by The Observer, as well as interviews with witnesses, indicate that Mr. Bloomberg funneled money to Mr. Haggerty, who claimed to be a 'volunteer,' sidestepping the political committee the mayor had promised to use to finance his election campaign. By deploying Mr. Haggerty and an unrelated political party, the mayor's team avoided drawing attention to a controversial election day tactic. But even more serious, experts say Bloomberg may have broken campaign finance laws,'' reported Mr. Roston. The way that CREEM structured the payments to Mr. Haggerty allowed CREEM to avoid having to legally disclose the payments (and controversial activities), and the structure troubles some legal experts. "This is clearly an attempt to evade the purpose of the law," John Moscow, a former white-collar prosecutor in Manhattan, told Mr. Roston. The controversial campaign reëlection-related services that Mr. Haggerty was hired to provide have been described as a ''ballot security operation.'' In Mr. Roston's article, the impression of the ballot security operation was to presumably discourage or fend off the voters of Mr. Bloomberg's opponent, Controller Bill Thompson (D), an African-American. Although alluded to, left unsaid was whether the ballot security operation was intended to deliberately turn away Mr. Thompson's African-American voters from the polls.